Six days into his job as an ironworker at a Northwest Territories diamond mine, 27-year-old Greg Wheeler’s work platform collapsed and he fell to the ground. He died instantly. At 20, Newfoundlander Greg Wheeler had found his calling as an ironworker. But seven years later, at a diamond mine in the Northwest Territories, his work platform collapsed and Greg fell to his death. 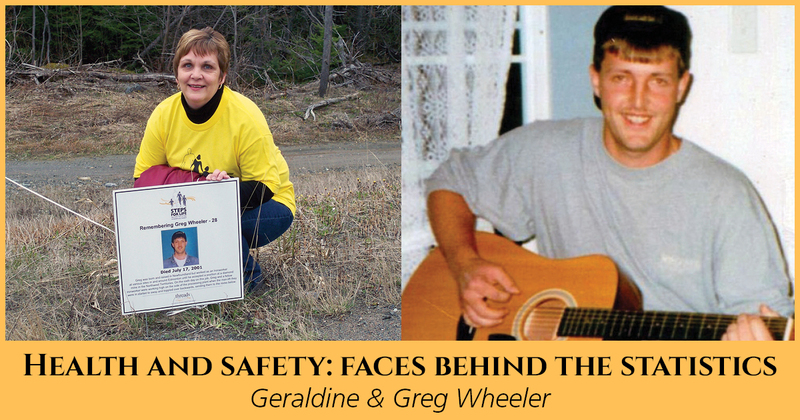 Even after many years, says his mother Geraldine, “the pain remains fresh, my heart remains broken.” A member of Threads of Life’s Speakers Bureau, she finds comfort in sharing stories about him and helping others who are grieving. Geraldine is now a member of the Threads of Life Speakers Bureau in Newfoundland. In addition to the Speakers Bureau, Geraldine has been a Threads of Life volunteer family guide and active supporter of the annual Corner Brook Steps for Life event. Read more of Geraldine’s story on page 2 of the Winter 2007 newsletter and in Forget Me Not, a Threads of Life book of family stories available at www.threadsoflife.ca/forget-me-not.